It's pretty fortunate that Ping Pong isn't the primary function of Omron's latest invention. If it were, it'd be a pretty terrible machine. See, although it can generally figure out the speed and trajectory of aball, it runs out of steam after around twenty volleys - meaning it loses the majority of its games. Neither the hardware nor the software under the robot's hood is particularly faulty, mind you. 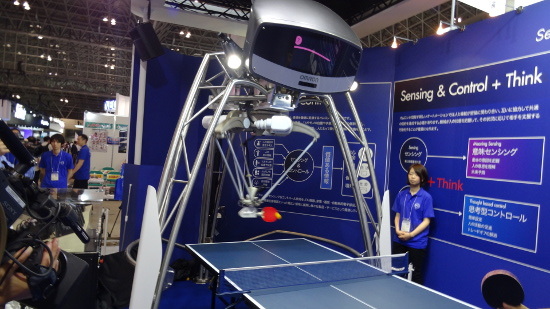 It's equipped with a number of sensors that allow it to track the speed and motion of the ball, the motion of its racket and the movements of the other player (among other things). Once it's taken in all external stimuli, it quickly calculates how it should react, using a number of computer algorithms to direct five independent motors. Thankfully, all that tech isn't going to waste - table tennis is just a means to an end. The real purpose of the device's games of table tennis is to teach it to adapt to its surroundings. See, the ultimate purpose of the 'bot and its eventual siblings isn't tabletop sports - it's factory work. Japanese manufacturer Omron hopes to eventually develop the prototype into a machine that's capable of adapting to its surroundings and discerning the difference between different types of components on the assembly line. This would represent a considerable change from current factory robots, which generally perform a few highly-specialized tasks. It's also looking to humanize the robot, in order to allow it to better work with its human counterparts. They've given it a simulated facial expression that changes with each shot - and presumably, will change based on what it's doing in the factory. Considering that its body sort of resembles the unholy union of a steel girder and a praying mantis, that's probably a good thing (though Michael Kanellos of Forbes claims it sort of grows on you after a while). Omron first showcased its invention in China earlier this year explaining that it was a key market - and that ping pong is a national pastime.